DESIGN. BUILD. GARDEN. HOST… MORE BEAUTIFULLY. 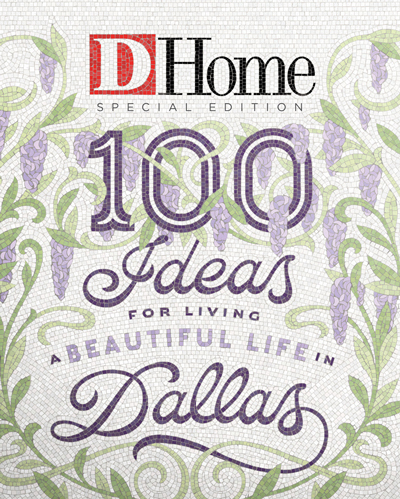 D Home’s 100 Ideas for Living a Beautiful Life in Dallas” is a sophisticated, intelligently written local handbook designed to help you make everything around you beautiful. 100 Ideas for Living a Beautiful Life in Dallas. D Home launched the special edition issue with a lively and beautiful event to remember. What is D Home 100? Local experts, interior designers, builders, gardening pros, and party planners share their secrets to making a beautiful life in Dallas. Where can I buy copies? You can buy copies at Whole Foods, Central Market, Sprouts. You can order a copy online here. For editorial questions, email Jessica Otte here. For sponsorship or advertising information, email Sophie Clarke here.